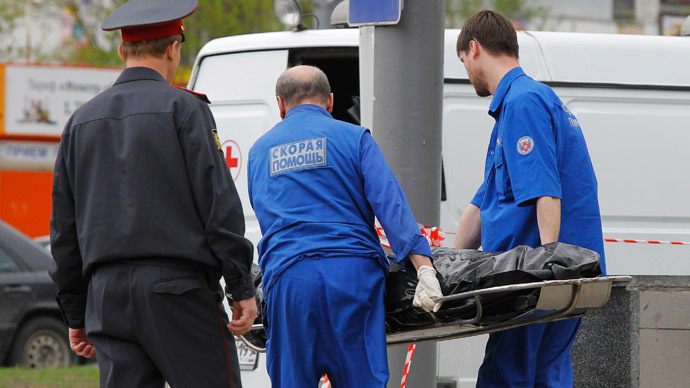 A suspected couple of serial killers have been arrested in Moscow, investigators reported. They are believed to have killed at least seven people in a crusade to ‘cleanse’ the city of its homeless population. The killings were committed between July 2014 and February 2015, Russia’s Investigative Committee said in a statement. The suspects, a 20-year-old man and a 25-year-old woman, targeted “homeless people with alcohol addiction.” The man said he wanted to ‘clean’ the city. Lifenews tabloid website said the list of the duo’s victims may be longer. According to its report, the suspects, named Pavel and Elena, have stabbed and beaten to death 12 people. The first of them, identified by Lifenews as 35-year-old Stanislav Evseev, had 107 stab wounds to his body, according to his father. Ironically, the victim was not homeless, but rather passed out on a park bench after drinking too much beer with his friend. The evidence in the other killings pointed to the same MO – dozens of stabs delivered to helpless victims, the tabloid said. The alleged killers were reportedly caught after failing to finish off their last intended victim on Sunday last week. The man, who works as a street cleaner, fended off the attackers with a screwdriver. Despite suffering from several knife wounds, he managed to get home and call for help. The man, who was taken to hospital and is currently in an intensive care unit, gave police a description of the two assailants, which lead to their arrest, Lifenews said. The police reportedly investigated the possible involvement of two other accomplices in the killing spree.